Summary : In ZoneOptions the risk averse learned who is wary of losing funds can benefit from the risk free offer that covers the first trade. ZoneOptions is a modern broker that was founded in 2011. It is owned by Capitals Markets Limited which is based in Cyprus. Their regulation and authorization is done by the Cyprus Securities and Exchange Commission. ZoneOptions is powered by the highly popular SpotOption CFD / Forexs trading platform, and the broker is owned by SpotOption as well. With this platform, it is possible to complete a trading transactions in just three steps. When you visit this broker, you will immediately be moved by how organized the site appears to be, due to the well thought out user interface. All the information that you need about making a trade and the broker itself is easily available, making this one of the most transparent and trustworthy sites you will come across. There are currently more than 70 assets that you can choose from with this broker. Furthermore, the variety of options available for trade including long term options, and 60 second, 90 second, 2 minute and 5 minutes options. To accommodate traders of different skill levels, One Touch Options and Ladder Options are also available. Getting started with this broker is simple, as the minimum deposit is only $200. Traders can experience pay outs that reach up to 85%. The minimum trade you can make is $25 whereas the maximum can extend to a generous $15,000. Before you start trading with real money you can get some practice with the demo account. On ZoneOptions, deposits and withdrawals can be made using various methods. The most popular include MoneyBookers, wire transfers and credit/debit cards. Direct deposits can also be made on the Liberty Reserve account. 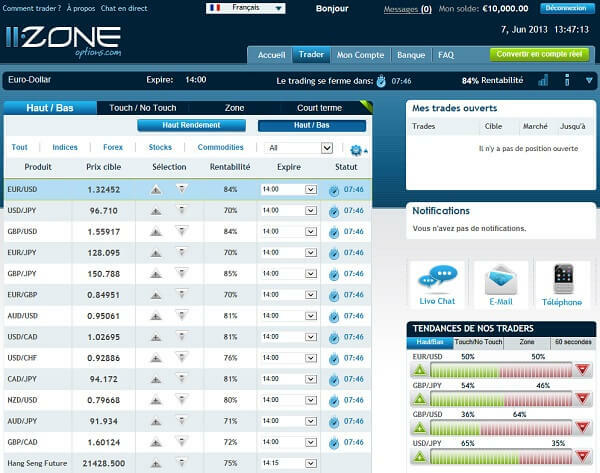 When you begin trading with ZoneOptions, you will receive a welcome bonus for your initial deposit. This will vary between 20% – 40% for your deposit. If you open a VIP account, you are also able to benefit from an iPhone 5 or iPad mini. There is also a refer-a-friend bonus where you are able to get 50% for each person that you refer who successfully opens an account with this broker. This site is highly intuitive which makes trading enjoyable. There are some excellent educational resources available, to help you get the basic knowledge that you need to become a successful trader. If you are a beginner and have no experience when it comes to trading, these resources will elevate your understanding and show you how you can make some money. These ensure that you are clear about all the different concepts and assets that are available on the platform. All the educational resources are available free of charge. To better help you manage your risk, you will find that this platform includes Early closure and Roll over features. There are also options that can give you a profit of up to 360%, which is excellent for traders who are in CFD / Forexs trading for a quick and sizeable return. The risk averse learned who is wary of losing funds can benefit from the risk free offer that covers the first trade. It covers loses up to 100%, which enables a trader to at least try out the platform without feat that they will lose everything that they put in. This is one feature that gives this site a competitive edge compared with the rest.